Are you looking for an easier way to carry your bikes? With many of today's SUVs coming with integrated trailer hitches and the popularity of aftermarket hitches, people are increasingly turning to hitch mounted bike racks as a preferred alternative for carrying bikes. This article reviews some of the advantages and disadvantages that hitch mounted bike racks offer as well as some of the variations that available on the market today. With the wide range of products available, choosing the right hitch bike rack isn't always easy. This article is designed to help you narrow the field and to identify a hitch mounted bike rack that fits your needs without breaking the bank. As many of today's vehicles are getting taller and wider, roof racks are facing increasing challenges. Many vehicles would require an NBA center or a step ladder to safely attach more than two bikes to a roof rack. This is where the hitch mounted bike rack comes in. Because the racks are at shoulder height or below, it is much easier to load and unload the bikes. The bikes are carried in the wind shadow of the vehicle, protecting them from bugs, rock chips, and the elements. The reduced wind resistance also minimizes wind noise and improves gas mileage. Have you ever had an embarrassing moment with driving your roof mounted bike into a drive-thru or into your garage? There are probably more of us than we care to admit. Aside from closing your garage door on the rack, hitch bike racks are virtually fool proof. If you're a weekend warrior, you can easily install and remove a hitch mounted bike rack from the car. If you enjoy boating, hitch mounted bike racks are also available with towing compatible mounts. Most hitch racks don't require the removal of the bike tires. Most modern trailer hitches are designed with an integrated "receiver". The receiver is a square opening that allows you to interchange towing accessories to suit your needs. Receiver hitches come in two main forms, a 2 inch opening or a 1.25 inch opening. In addition to the opening size, hitches are rated for their weight carrying capacity. If you have a 1.25 inch hitch opening, you should check that your hitch rating is at least 2x the weight of your bikes. Most Class I hitches (200 lb rating) typically limit the rack capacity to two bikes. Class II and above can generally carry four bikes. If you have any questions, contact us for detailed recommendations. Many of today's SUVs and minivans have large rear doors for accessing your cargo. Having a hitch mounted bike rack can prevent you from opening the door and accessing your gear. If that's not a big deal to you, a fixed mount bike rack may be a good choice for you, as they generally come at an attractive price. For people wanting cargo access, there are two main solutions to consider. Second, for people who frequently access the rear hatch, another alternative is the swing-away rack option. These racks feature the ability to swing the rack out of the path of the rear hatch while the bikes are mounted to the rack. As you're not raising or lowering the rack, minimal strength is required. Because the rack swings the bikes completely away from the rear of the vehicle, this style of rack also provides for the best cargo access. The downside is that the swing away racks are usually heavier and more awkward to install into your hitch. Hitch mount bike racks typically offer from two to five bike capacities. Some racks offer the ability to add additional bike capacity at a later time. Make sure you hitch is capable of supporting the weight of the bikes. This is especially important with Class I and II hitches which come in the 1.25" receiver size. One of the main differences between bike rack models is how the bikes are attached to the hitch rack. If your bikes all have standard men's frames, you can select a rack with standard frame mounts. These tend to be the least expensive of the attachment options. If you have a mix of frame types you have three main options. What good is it to have your bikes locked to your hitch rack when your rack isn't locked to the vehicle you ask? That's why locking hitch pins are often used to secure the rack. The locking hitch pins come in two main forms. The standard hitch locks simply lock the hitch bike rack into your receiver. "No wobble" hitch locks offer the added advantage of tightening the hitch rack against your receiver to minimize vibration and play. 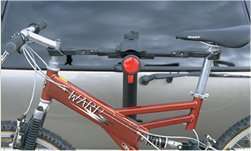 Many hitch bike rack manufacturers include hitch locks with their racks. Unlike the roof mounted rack market, which is dominated by two or three main suppliers, the hitch mounted bike rack market has over a dozen companies supplying quality, competitive products. While they do offer quality products, traditional, well-advertised hitch bike rack brands like Thule and Yakima can come with a hefty price tag with only similar performance to some of the lower cost alternatives. Less advertised brands that offer quality products and unique features include manufacturers such as Softride, Hollywood, Draftmaster, and Swagman. Hitch mounted racks can be had for as little as $100 up to as much as $700. Racks to address most needs are generally had for between $200-300. Now that you're familiar with the range of hitch bike rack options, you can narrow down your search to models that fit your unique needs. We've grouped the hitch bike racks by capacity below. We've also created a list of Top Picks that we believe are some of the best in the industry. If you aren't sure which one would fit your needs best, feel free to contact us.